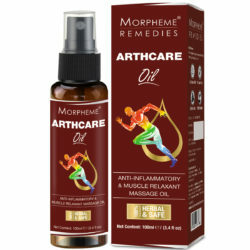 Morpheme Remedies Arthcare Oil With Spray is a product that is said to be beneficial for those people who are suffering from muscular discomfort. The anti-inflammatory herbs in this product are supposed to be responsible for giving relief from pain due to sore tissues. 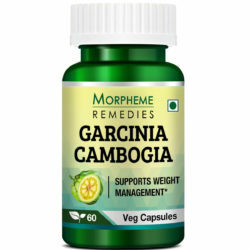 Morpheme Remedies Arthcare Oil With Spray not only offer relief to the sore tissues but it is also said to nourish the muscles and the joints. This product has an amalgamation of some of the best natural ingredients that bestow its numerous benefits on the patient. Morpheme Remedies Arthcare Oil with Spray is a combination of a large number of natural herbs. Each of these ingredients have their own benefits. 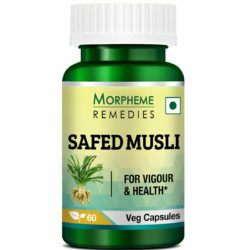 For the best results one needs to massage this oil on a daily basis to the affected joints. 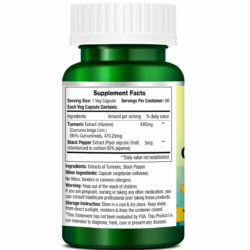 Contains combination of natural anti-inflammatory ingredients. 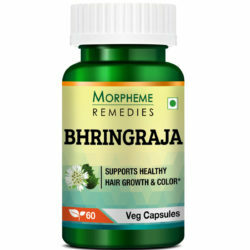 Natural product which is said to be safe for prolonged use. How Is Arthcare Oil Useful? In Ayurvedic medicine Ashwagandha (Withania somnifera) may help to improve the overall physical and mental health. Arthcare Oil blends a number of herbs that are recognized for their anti-inflammatory, analgesic and anti-arthritic activities. The massage oil rapidly penetrates the skin and soothes and cools the painful site. The anti-inflammatory constituents of the herbal oil act directly on the inflammatory molecules present in the affected area, thereby helping in suppressing their inflammatory activities and providing fast relief from pain and inflammation. One of the key anti-inflammatory ingredients in Arthcare Oil is guggul. Guggul is the oleoresin that exudes from the branch of the Commiphora mukul tree when it is injured. In Ayurveda, guggul is widely used for reducing pain and inflammation. Scientific studies have validated the traditional use of guggul. Studies have shown that the active constituents of guggul, guggulusteroids and terpenoids have powerful anti-inflammatory property. They work by inhibiting activities of the pro-inflammatory enzymes and suppressing lipid peroxidation, which worsens the symptoms of arthritis and stimulate degeneration of the joint tissues. Arthcare Oil contains garlic, another herb traditionally used for reducing pain and swelling. The sulfur containing compounds in garlic inhibit activation of the pro-inflammatory molecules, which helps in reducing inflammation of the muscles and joints. 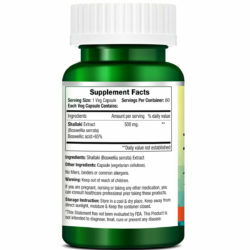 Another important anti-arthritic ingredient in Arthcare oil is Ashwagandha. Apart from suppressing activities of inflammatory enzymes and proteins, Ashwagandha also helps in slowing down degradation of cartilages in the joints. 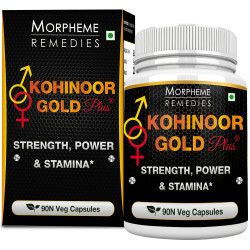 Hence, it is beneficial for people suffering from osteoarthritis. Ashwagandha is also considered effective in reducing inflammation induced by buildup of urate crystals in the joints. 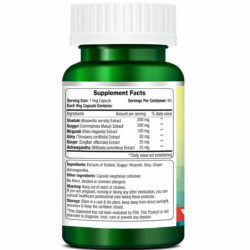 Withaferin A, an active constituent in Ashwagandha, is a potent anti-inflammatory and antioxidant compound. Studies suggest that it helps in reversing the monosodium urate-crystal induced changes in the joints that trigger gouty arthritis flare-ups. Pluchea lanceolata, commonly known as Rasna, is known to help in alleviating the symptoms of rheumatoid arthritis. In folk medicines poultice of the Rasna leaves are applied to the painful joints to help reduce pain and swelling. 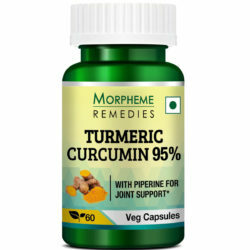 The anti-inflammatory activity of the herb is attributed to its immunosuppressive activity. By inhibiting activities of the immune cells that trigger unwanted inflammation, Pluchea lanceolata helps in improving the symptoms of autoimmune diseases such as rheumatoid arthritis. Arthcare Oil is further enriched with Cedrus deodara, Vitex Negundo, Paederia foetida, castor oil, camphor and a number of other ingredients. 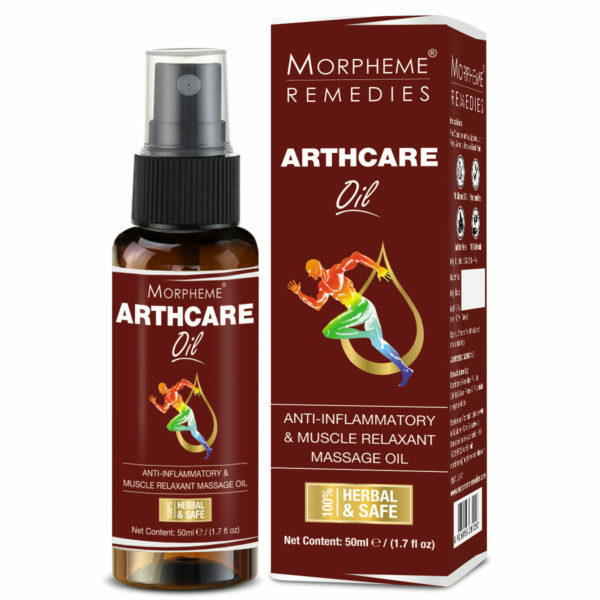 All the constituents of Arthcare Oil work together to reduce pain, swelling, and stiffness of the joints. Massaging the muscles with Arthcare oil helps to soothe the sore muscles and, in most cases, helps in providing fast relief from pain. Regular use of Arthcare Oil helps in strengthening the muscles and joints and improving joint mobility. How long does it take for the herbal oil to act? Arthcare Oil is a fast acting formula.It helps in soothing the sore muscles and painful joints within a few minutes after you start massaging with the herbal oil. For optimal result, massage the painful area at least twice a day with Arthcare Oil. Arthcare Oil is an absolutely safe product. You can use it even for a prolonged period without worrying about adverse reactions. As it is strictly meant only for external use, there is no risk of using Arthcare Oil. Can everyone use Arthcare Oil? 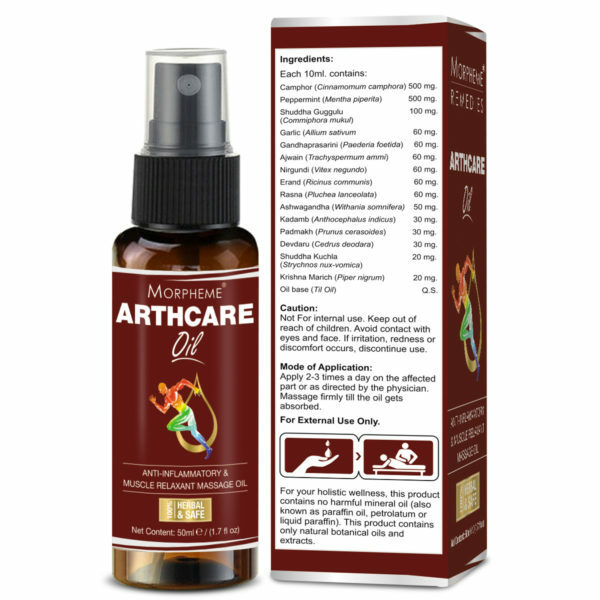 Regardless of age and health condition, Arthcare Oil is suitable for everyone suffering from joint and muscle pain. Oil base (Til Oil) Q.S. Direction: One can apply the oil 1 to 2 times daily or as per requirement. It is said that the oil can be applied directly to the sore tissues but it is better to check with a medical expert before you start using the oil.